© The Estate of Patrick Caulfield. All rights reserved, DACS 2018. 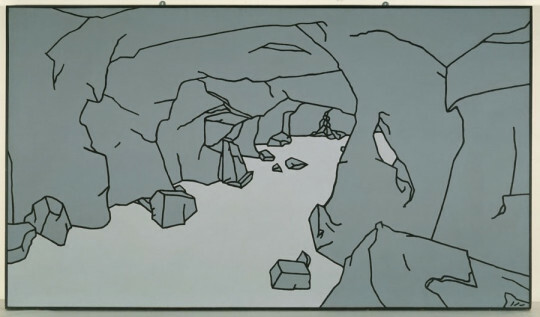 The black lines that so clean up the cave’s crags and gravel can also be related to Caulfield’s first trip abroad, to Crete in the summer between leaving Chelsea and starting at the RCA. He was wowed by the liberally restored palace at Knossos, where ‘the terracotta red and black contrasts seemed Japanese or at least oriental; the vivid¬ness of colour and sharp contours struck me quite forcibly’. (8) Caulfield had a magpie eye for the vivid, and ‘crude’ Touristico postcards were as exciting as Fernand Léger’s bold objects or Hergé’s Adventures of Tintin. It was this embrace of visual sources high and low that saw him lumped with the Pop movement – a cause of irritation to Caulfield, who maintained his work shared none of Pop’s ‘social realism’. In View Inside a Caveexactitude combines with an absence of detail to create an enveloping atmosphere by disarmingly economic means. Indeed Christopher Finch’s memorable phrase for Caulfield – ‘a romantic disarmed by his own irony’ – directs our attention to the poetry of Jules Laforgue. (9) Caulfield, a fan since college days, uses words such as ‘succinct’, ‘condensed’, ‘crisp’, and ‘pungent’ to describe Laforgue’s imagery, words that equally apply to his own. (10) Nowhere more so than in his treatment of the cave, a subject not without weighty precedent. A century before, Gustave Courbet had confronted the refined style and strictures on subject matter that ruled academic painting with his fantastically crusty caves, such as Grotto of Sarrazine (1864),(11) where the paint is almost sculpted, and the cave’s mouth curls round like an Atlantic breaker, affirming the concrete reality of an empty landscape. As if in subdued reference, Caulfield chooses to paint on the slightly rougher reverse side of the hardboard. He has put both subject and style through the refinery, distilling the atmosphere of emptiness. Graceful, raffish even, View Inside a Cave leads us on. Behind it, echoes of man’s primeval art; ahead, we can only guess the next frame. 1. Marco Livingstone, ‘Perspectives on Painting: Seven essays on the art of Patrick Caulfield’, in Patrick Caulfield, exh. cat. (London: Hayward Gallery, 1999), 13. 2. Caulfield in dialogue with Bryan Robertson, in Patrick Caulfield (1999), 24. 3. Letter from Caulfield to Andrea Rose (March 1990), quoted in For a Wider World: Sixty Works from the British Council Collection, exh. cat. (London: British Council, 1990), 88. 6. Manchester Art Gallery, and Museo Nacional de Arte Reina Sofia, Madrid, respectively. 7. Caulfield quoted in Marco Livingstone, Patrick Caulfield: Paintings (Aldershot & Burlington: Lund Humphries, 2005), 19. 8. Dialogue with Bryan Robertson, 25. 9. Christopher Finch, ‘The Paintings of Patrick Caulfield’, Art International (20 January 1966), 49. 10. Dialogue with Bryan Robertson, 28. 11. The J. Paul Getty Museum, Los Angeles.